In the first part of this trilogy, Dimitri of Editions Atlas outlined the background surrounding the decision to produce a new series of miniatures, the Saab Cars Museum Collection. The second part explained to us how the latest technology was used to scan the Saab Cars Top models from the Museum. In this third and last part we learn how the pre production of the model cars is made. 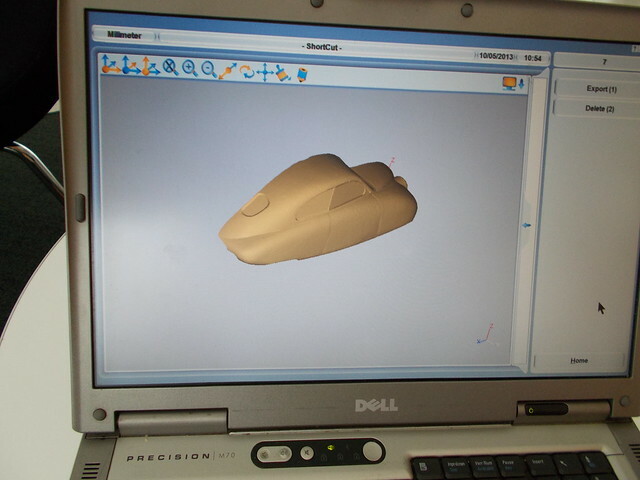 (…) Here they will compile all of the information and produce a 3D simulation of the mould they will create. Why are Editions Atlas interested in Saabs? Over the course of the meeting held in Huy in early November 2013 you got the opportunity to discover the first models belonging to a new collection announced by Editions Atlas: the Saab Car Museum Collection. The collection is now launched in Scandinavia, followed by Finland, then gradually in other markets in which Editions Atlas already operate. The Saab Farm will be responsible for marketing operations in other countries. Editions Atlas is a commercial concern whose products are aimed at a wide audience. Its aim is not, therefore, to sell small numbers of very sophisticated models to a handful of enthusiasts who have the necessary means but rather to appeal to as many people as possible by offering a comprehensive and well-structured collection at very affordable prices for the best possible quality. Atlas has been expanding its operations in the Nordic countries over recent years, launching a collection of 1:43 Volvo models in 2011. So successful was the initiative that of the 30 models that Atlas originally intended to introduce, there are already plans for one or even several extensions, taking the collection up to a potential 60 models. As a result of this success and of the evident demand, Atlas would like to test the viability of another single-brand collection with Saab. Initial tests have proven positive, meaning that work can now begin on developing a collection. This development will no doubt be boosted by the fact that the new recruit within the new product development department, who happens to specialise in miniature cars, is himself a Saabist – and a collector to boot [Editor’s note: of both miniature and full-scale Saabs]! New Saab Models Coming Soon. 2014 will see a nice new line up of model Saabs in 1:43rd scale for us Mini Saab Fans. Andrei from Griffin Models (www.griffinmodels.com) has been hard at work producing and developing a few rare models like the EV-1 and the Phoenix as well as the Turbo X in both Saloon and Estate versions.